An interesting issue raised recently in social media circles is where to start with a student. What particular pedagogical approach or exercise modality is helpful for a new student coming in to work on their singing voice, and what would be the logic be behind such an approach? Do you work on resonance first? How about musicianship? Do you stress breathing and intercostal-diaphragmatic control? How about diction? Perhaps we should work on how to pronounce all the words in “Amarilli, mia bella” before we start working the voice? What are the ‘fundamentals’? These questions can be vexing for a teacher, overwhelmed by the sheer amount of work that needs to be accomplished by any student in a given time period. Determination on where to start also tells a lot about a instructor’s personal pedagogy, as well what they ‘hear’ and what they’re ‘listening for’ in the singer’s voice. A teacher who thinks that resonance is ‘fundamental’ is going to start with formants, acoustics, and vowel tuning. A breath-centered teacher might spend a lot of time perfecting the breathing first, helping the student to take deep inspiratory breath, perhaps even having them bend over and breath into the back, or lay on the floor and breath with books on their chest. For the masters of the bel canto “Old Italian School” sustained tones were the very first exercises that were given. This way of exercising is almost identical in EVERY text in the Old Italian tradition. 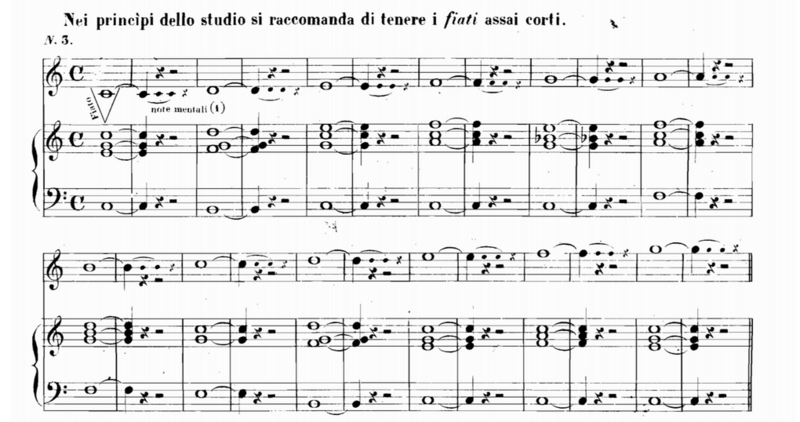 Gioachino Rossini‘s first exercise from his “Gorgegghi e Solfeggi” is the following. No direction is given in its execution, except for the marking of each tone as a messa di voce – starting the tone quietly (a head-dominant sound) and gradually crescendo-ing to a forte (a more chest-dominant sound). The extent of the scale – an octave and a half – is rather lengthy for the beginner. Francesco Lamperti‘s first vocal exercise? William Shakespeare (not the bard), a student of Lamperti’s, put the sustained tone on ah as his first exercise in his treatise as well. Shakespeare added in all the vowels for extra measure! August Mathieu Panseron, a student of Salieri (Mozart’s rival!) also demonstrated complete agreement on his starting exercises, with the additional notation that these sustained tones should be sung in CHEST REGISTER with messa di voce. 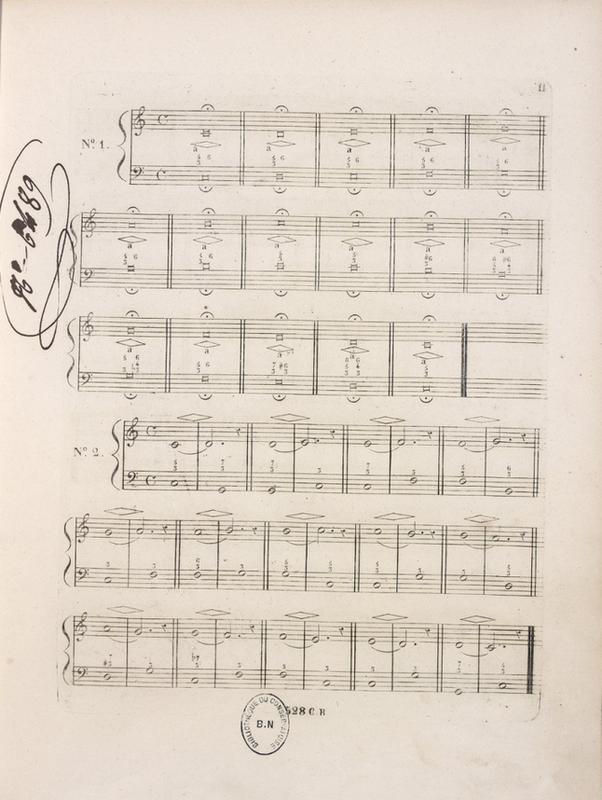 Gaetano Nava, not to be outdone, also lists the same exact starting exercise in his “Method“, including the additional instructions of falsetto and petto (chest) in A major. Giuseppe Concone, the great maestro di canto and author of many vocalization books, place the sustained tone (also with messa di voce) as his first exercise in a book of DAILY vocalization material that was to form the routine of any singer. 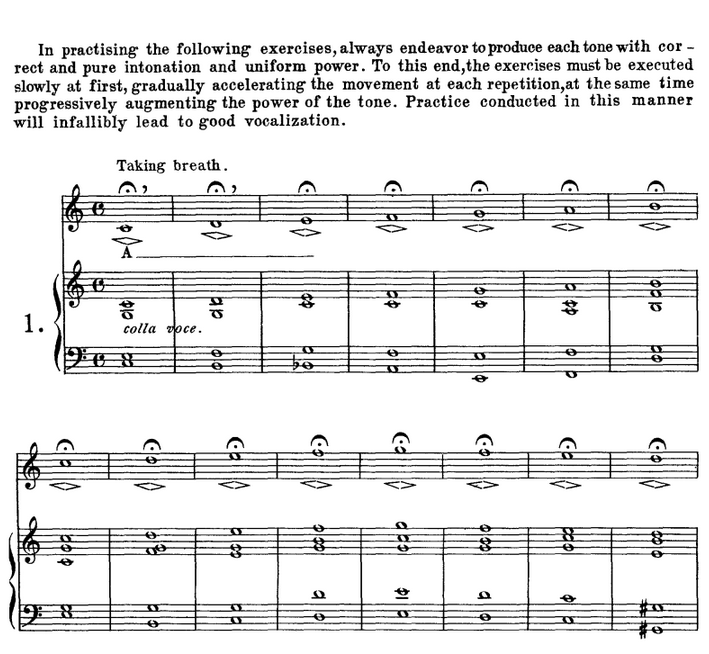 Mathilde Marchesi‘s first ‘elementary’ exercise also was the sustained tone. 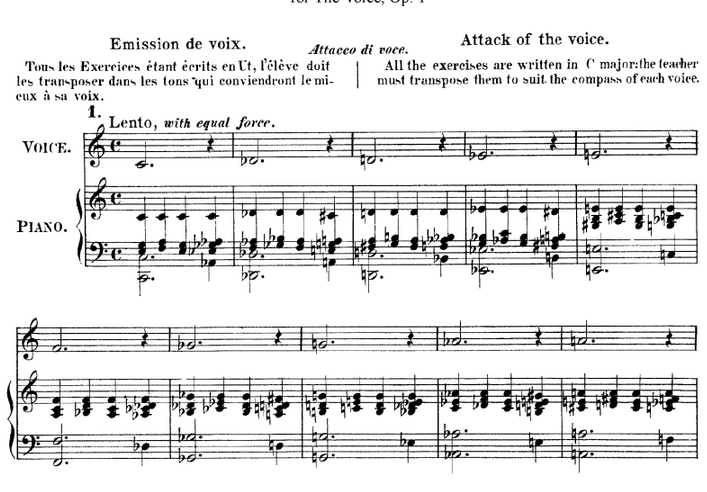 For Marchesi the purpose of the exercises was (in French) the emission of the voice, and in Italian and English the attack of the voice. These are differing concepts, especially the idea of emission versus attack, but this falls in line with much of the Old School as well. Her exercises were to be sung with equal force (no messa di voce). Pauline Viardot-Garcia, the sister of Manuel Garcia and Maria Malibran, also featured the sustained tone as the first exercise of her text, “An Hour of Study“. In it, she also, like Nava and Panseron, advises the student to start “Full chest voice without effort. 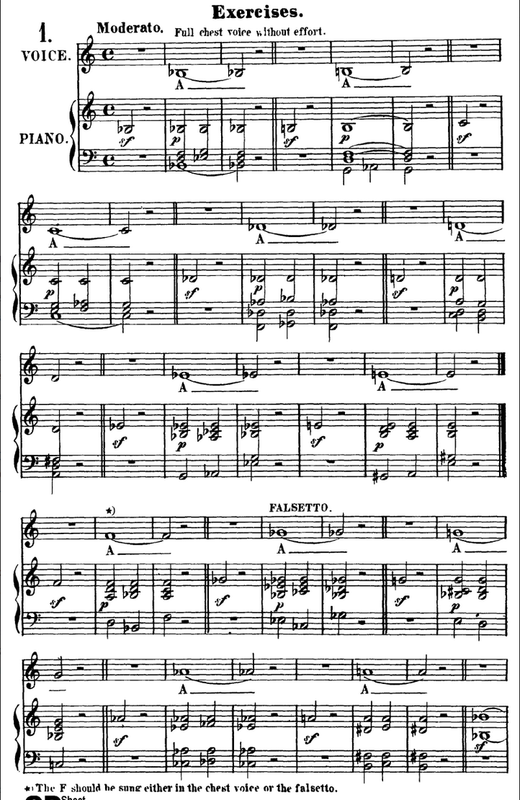 When the singer (presumably female) reached F4 she was to sing the tone either in chest or falsetto (Viardot’s word, not mine), and to continue up the scale in like manner in the falsetto. Those are a lot of old school pedagogues and musical examples. The consensus is pretty clear – sustained tones, more than likely with some kind of messa di voce and usually on an ‘ah’ vowel. What specifically do we know today from a functional standpoint of how the voice works, and how do these exercises place themselves into the current knowledge that we have? We know that the adduction and tension of the vocal folds is brought about by the action of the thyroarytenoid (TA) and the interarytenoids (IA). We also know that the stretching of the vocal cords are largely due to the action of the cricothyroid muscle system (CT). A ratio of tension that is geared more toward the TA than the CT gives us an action that might have its aural equivalency in a ‘chest register’ sound. If the closers/tensors of the vocal folds are lax or weak from atrophy, the resulting sound is weaker, usually more breathy, and ‘veiled’. Higher tones might be easier to sing in this particular mechanism. The tonal texture takes on a more ‘false’ quality and the tone might be described as falsetto. In these specific exercises above we see single tones low in the vocal range, not agility patterns. This would tilt the functional balance of the tone to the arytenoid muscle system, the cricothyroid system opposing it at a somewhat constant rate of tension (for example, we’re not singing coloratura or lighter agility patterns, which would require a much more nimble relationship between the TA and the CT). Sustained or sostenuto singing requires a rather active engagement of the TA musculature. If we’re sliding up and down, or singing high light pitches, we’re probably in some kind of CT dominance. We can infer this assumption because of the remarks to sing in ‘full chest’ or to crescendo to a louder dynamic. Had these exercises been asked for in a QUIET manner, then perhaps a more CT dominant function would have been the purpose. This is not the case. For the oldest writers on voice, the CHEST VOICE was the determining factor of all singing. That can clearly be seen by how low in the range each of the above examples starts. All of them begin in the tonal area of what would be considered the chest voice. Up to the 1850s, the voice was a two-register system, a vox integra and a vox ficta (a natural and a false voice). This later translated into a chest/falsetto or chest/head nomenclature depending on the pedagogue. Of these two ‘voices’ or today what we might call ‘registers’ the preferred one was the natural or chest voice. The falsetto was shunned as a voice to sing in by most of the old writers. 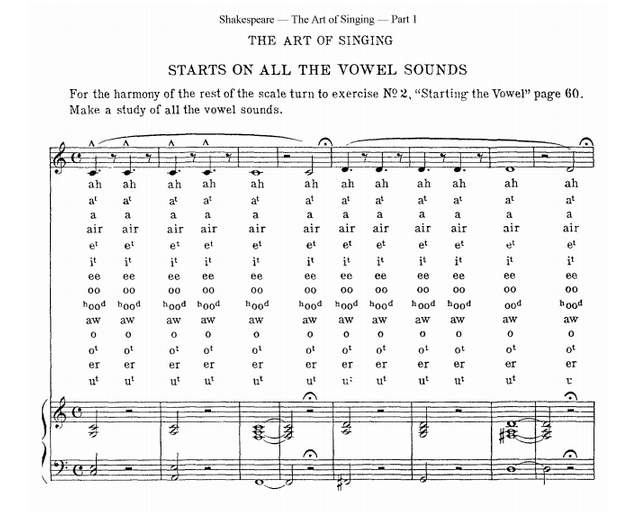 So where do I begin as a teacher interested in Old World lines married to an understanding of vocal function? I start low in the chest. I start with the vocal registers. Registers are a laryngeal event, and determine the radiating freedom of the entire tripartite system. Not diction, not resonance (a by-product of laryngeal function), not breathing (usually not the CAUSE of voice problems). Is there a functional chest voice? Is the pitch true? That is, is it in tune? What is the onset like? Is it breathy? Harsh? Too glottal? What is tonal quality like? Free? Rigid? Harsh? Squeezed? Is the singer ‘putting on’ a voice that is not related to the voice that they speak with? Are they psychologically armored in their approach to singing? How are they transitioning OUT of the chest? Can they get out of it? Or is it all chest all the way up, to a yelly quality? Is there a smooth transition out of the chest? 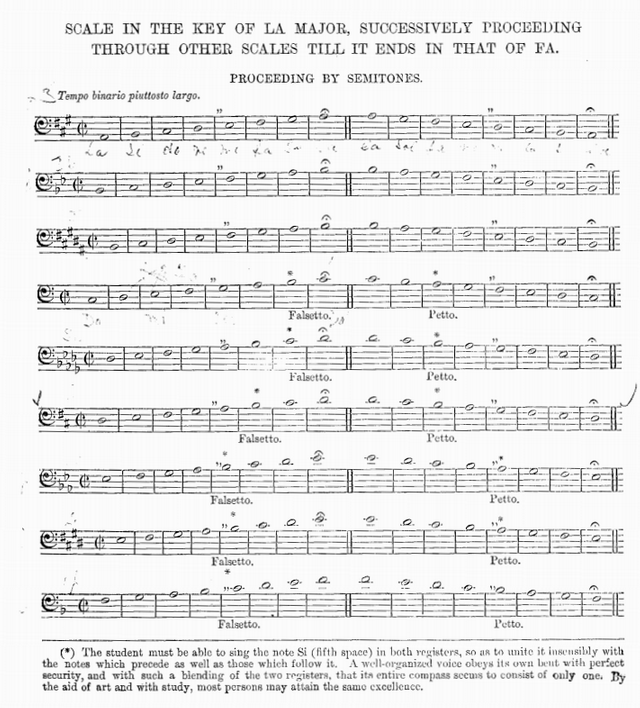 Is there a ‘break’ or a ‘flip’ of the registers at certain points in the scale? Is there a cataclysmic event in the passaggio of some kind? Is the vowel staying pure as the scale is mounting, or is there some overt mechanical adjustment taking place to get higher notes? Does the vibrato continue at a regular interval? Does it speed up or slow down or stop? From here, the entire pedagogical direction can be determined in a student for that lesson. If the registers are well-coordinated and balanced (RARE even in the most ELITE singers), then issues of ‘finishing’ and ‘polishing’ can take place: resonance adjustment, diction of languages, musicianship, without risk that the singer will LOSE the balance of their vocal work. But to place any of those items before the correct function of the instrument itself is to place a cart before a horse. To close, it’s also interesting to note that voice scientist Joseph Stemple, PhD, has developed and tested a series of vocal maneuvers called, “Vocal Function Exercises“. These exercises consists almost entirely of SUSTAINED tones, mixed in with exercises that also stretch the vocal folds. Their purpose? To offer the voice a variety of tasks to rebuild a damaged voice, as well as to continue to develop an already developed voice. Their efficacy has been proven several times in scholarly journals found here, here, here, here, here, here, here, and here. If the greatest masters of singing agreed on this point, why don’t we? Why are we muddying the waters with peripheral concerns best left till the voice has achieved some level of freedom? And why are we arguing about ‘these confusing old treatises’ when the clarity demonstrated above is as clear as day? Could they have been wrong? No. There are too many great singers in the annals of history that lived and breathed these ideas and that were PROOF of working in this pedagogical way. Previous postWho Do You Think Sang This Stuff? This view, one with which I agree, is in keeping with Herman Klein’s teaching of “Singing Position,” he being a student of Manuel García. I believe it’s worth mentioning that, in the texts cited, the authors address breathing before they introduce exercises, which may explain why some teachers take that route. As for demonstrating a clear /a/ vowel from the get-go (and they were writing about an Italianate /a/), that can be, and often is, difficult for the American who speaks either nasally or gutturally, which most do. Suffice it to say, I have the utmost respect for my colleagues who endeavor to make the teachings of the Old School a reality. It takes great skill. Thank you for your comment. Yes! Mr. Austin is another teacher sharing great information from the early writers. If you can manage to get a copy of his book of the reprint of Carlo Bassini, it’s wonderful. Also, Daniel Shigo’s book “Hidden in Plain Sight” is another gem.